Blue Lagoon Cruises has relaunched it’s flagship vessel Fiji Princess back into the waters of Fiji following a $1.2m refurbishment last month. Chief Executive Officer Peter Duncan said the small boutique cruise ship had a long history cruising the islands of Fiji. “Fiji Princess has a long history in Fiji and it was high time she had a rest and a makeover,” Mr Duncan said. "All interiors have been completely made over, and, paying tribute to the company's long maritime history, the theme is nautically inspired," he said. "Blue Lagoon Cruises has recently come under our management and we have made several changes based on guest feedback including brand new itineraries with a maximum of four hours cruising each day, more activities and a more personal experience of the Fijian culture,"
Blue Lagoon Cruises commenced an intensive “re-launch” through the travel trade industry at the Fijian Tourism Exchange and is continuing activity together with travel media internationally. 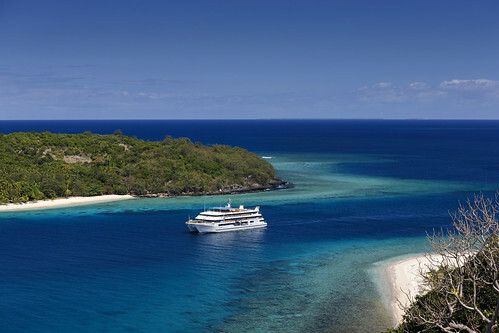 "Our cruises are popular with people wanting to experience the ‘real’ Fiji – rather than just sitting in a 5 star resort for their holiday – and being a smaller boutique cruise ship means we can get right up close to the beaches and islands - we even tie up to a coconut tree at our anchorage just off our own private beach at Nanuya Lailai,” Mr Duncan said. “We also work closely with the island communities to give our guests a taste of what life is like for these communities living on remote islands,” he said. Cruises are based in the Yasawa Islands (now with transfers available from Mamanuca Island Resorts) and range in length from 3 to 7 nights.